LCDs are offered in three basic light transmission modes: reflective, transflective, and transmissive. In the reflective mode, ambient light is used to illuminate the display. This is achieved by combining a reflector with the rear polarizer. It works best in an outdoor or well-lighted office environment. 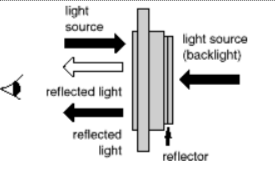 Reflector bonded to the rear polarizer reflects the incoming ambient light. Low power consumption. 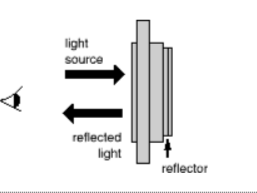 Transflective LCDs are a mixture of the reflective and transmissive types, with the rear polarizer having partial reflectivity. They are combined with a backlight for use in all types of lighting conditions. The backlight can be left off where there is sufficient outside lighting, conserving power. In darker environments, the backlight is turned on to provide a bright display. Transflective LCDs will not “wash out” when operated in direct sunlight. Transflector bonded to the rear polarizer reflects light from front as well as enabling lights to pass through the back. Used with backlight off in bright light and with it on in low light to reduce power consumption. Transmissive LCDs have a transparent rear polarizer and do not reflect ambient light. They require a backlight to be visible. They work best in low light conditions with the backlight on continuously. Without reflector or transflector bonded to the rear polarizer. Backlight required. Most common is a transmissive negative image.